Back to the ongoing Lost and the Damned Tactica with this post, this time looking at the Air Support formations available to the list and the role that they can play in armies. 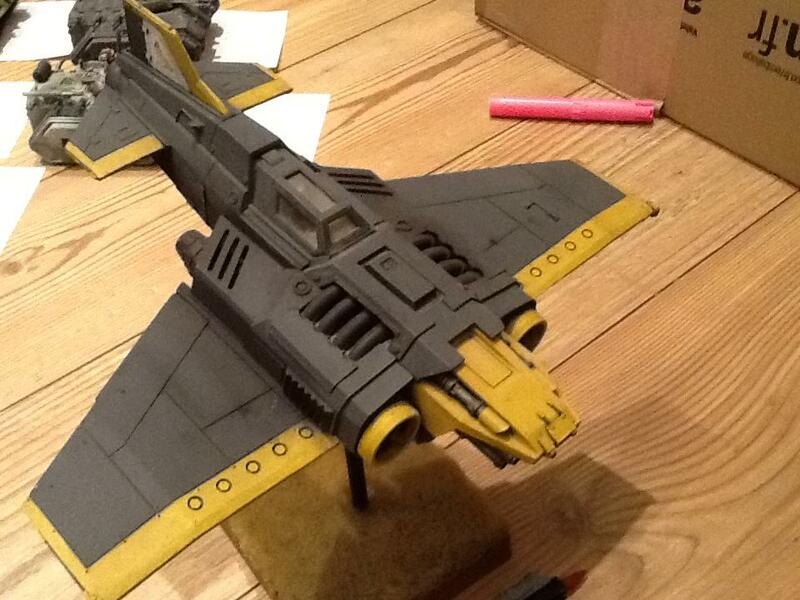 As a quick note, I will be covering the Doomwings and Firelord Daemon Engines in an upcoming Daemon Engines post even though they are flyers, but the Daemon Engines post may be a while coming – there is alot to talk about! 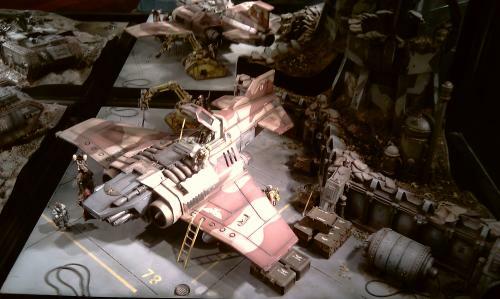 So, the Lost and the Damned list has the choice of two air formations, both ripped straight from the Steel Legion Imperial Guard list and probably very familiar to any Space Marine players too. The two formations, Traitor Thunderbolt Fighter-Bombers and Traitor Marauder Bombers, both have very different functions. 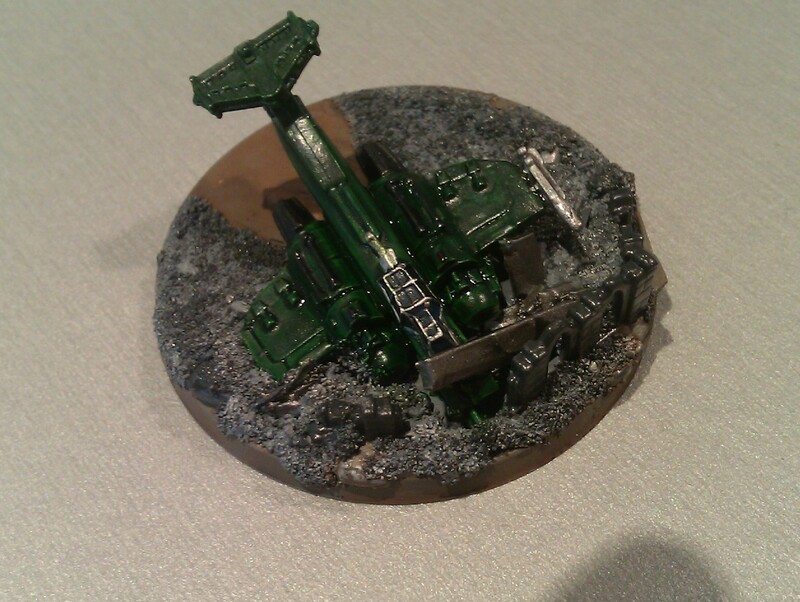 A 40k sized Thunderbolt I have recently bought. The ubiquity of Thunderbolt formations in Lost and the Damned lists is both a testament to their usefulness in the context of the list as a whole, and the genesis of the recurring joke that the first thing a planetary governor faced by a revolt should do is lock up all the pilots (and Sentinel drivers…). The reason for this ubiquity is the way in which Thunderbolt formations provide the list with the ability to reach out and touch the enemy at long range, with good AT firepower which is a weakness of the list, and also provide good Intercept and AA coverage, which as we have seen is another weakness of the list. So the Thunderbolts, for a relatively cheap cost, provide the LatD player with the ability to effectively shore up the structural weaknesses of the army to a certain degree. I have to admit, I have never been able to get Marauders to work effectively for me either in the Lost and the Damned or in any of the Imperial lists that use them. They are very fragile, and even though they put out 6BP as a formation, I have found ground artillery to generally be a better investment, because as soon as one Marauder is downed the usefulness of the formation drops significantly. In the context of the Lost and the Damned list, they compete against Basilisks in the Traitor Artillery Battery formation, and against Griffons embedded in Cultist Covens. One thing to note about the Lost and the Damned list is that its access to air formations is slightly different. While normally War Engine and Air Support are limited to 1/3 or 1/4 of the total army points, in the Lost and the Damned list they are included in the 1 Coven : 1 Support formation ratio – meaning that you can take one air formation for every Cultist Coven. Realistically I don’t think this is every likely to make much difference (I tend to take 2 formations of Thunderbolts in most lists, one for attacks, one to help with AA / Intercept), but it does raise the amusing possibility of a 3k list with 8 barebones Covens and 8 formations of Thunderbolts! I thought the Thunderbolts were limited to 2 per unit? Loving this series btw. I have a LaTD army myself and I’m learning a lot from this. Yeah the thunderbolts are limited to 2 per formation, but the number of formations available is only limited by the number of Cultist Covens. I am glad someone is finding it useful, I know LatD is a bit niche! Charting the course of the rising tide of miniatures steadily taking over my life, I hope this blog will become a central area for painting, modelling and gaming content. My name is Gus, I am based in Lampeter, Wales, and I have been playing GW games for far too many years and now have models bulging from every cupboard. I play and enjoy talking about – Epic Armageddon, Battlefleet Gothic, Necromunda, Inquisimunda, Inquisitor 28mm, Mordheim, Warmaster, and a smattering of Warhammer 40k and fantasy . Hope you enjoy the blog! EPIC Vox – en francais!